Enter to Win a Freeburg Chamber Beer Bucket! The Chili Cook Off and Fall Festival was a big hit in 2018, thrilling the community, filling bellies, giving local businesses a platform to promote themselves, and raising money for two worth causes in our great community. 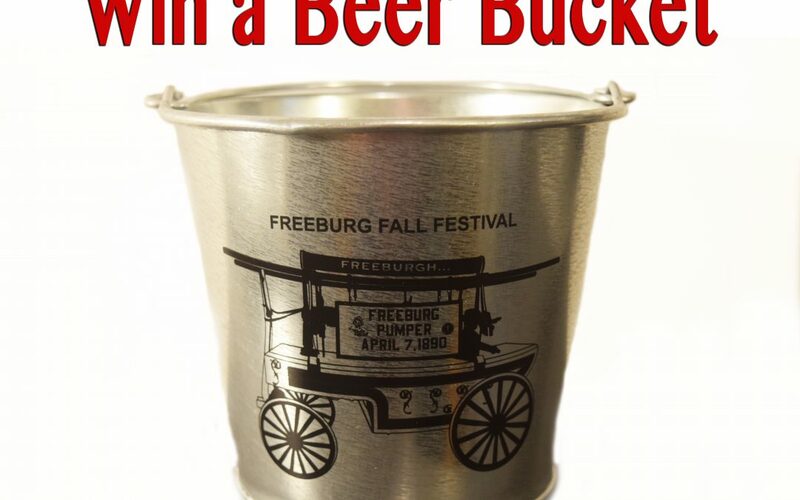 A big part of that success is the triumphant return of the Freeburg beer bucket, which we sell at the Chili Cook Off with the option for refills of draft beer. For the last few years, we’ve offered the buckets with an imprint relating to the history of our community. In 2018, our bucket featured the antique pumper that has been a parade and display fixture of the Freeburg Fire Department. Once the buckets are sold, they are in private hands forever. The Fall Festival is the one and only place to get your hands on this beautiful, practical piece of Freeburg memorabilia that makes a one-of-a-kind addition to any home bar. This is your chance to get ahold of one of our commemorative beer buckets. We are giving away the last of our beer buckets on our Facebook account and our newly created Twitter account. Enter on Facebook by liking the post, sharing the post, and commenting below. Enter on Twitter by liking and retweeting. A winner will be selected at random and given this great piece of Freeburg memorabilia. If you miss out and want to get in on the action next year, be sure to like the Freeburg Chamber and the Chili Cook Off on Facebook for all the latest updates. Be sure to follow our new Twitter account for all the latest on the fun community events being organized by the Chamber. Speaking of great events, our annual banquet this year is can’t miss. For $40, you will get admission to the Freeburg Downs Mouse Races. These races feature high-end prizes, as well as marketing opportunities. You can sponsor a mouse by contacting Cindy Niebruegge at ______. With your ticket, you are also entitled to an all-you-can-eat prime rib dinner (with chicken breast also available), as well as an open bar. Please join us for fun, good food, better company, and a celebration of the vibrant business community in Freeburg.